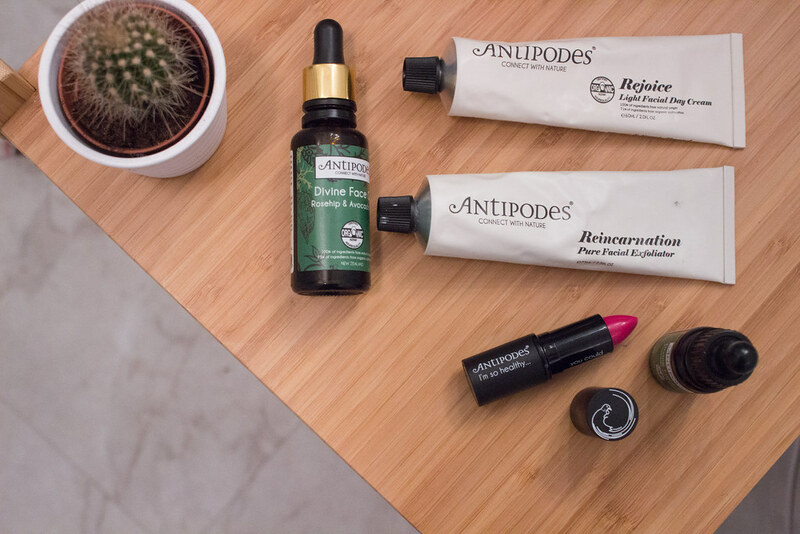 I have known about Antipodes for years; I think I remember seeing some of their products pop up in one of Estee Lalonde’s empties videos (I love those). I was always so tempted but the price put me off. Don’t get me wrong, I’m not rolling around on a bed of cash or recreating the bath scene from the Look What You Made Me Do video with all my jewels. Since beginning to learn more about ethical and toxin-free products, I am happy to pay more for high quality, organic, ethically sourced ingredients and products. Why did I buy from Antipodes? I thought it would be interesting to include a section on why I think Antipodes meet my ethical and sustainable requirements. The New Zealand-based company focus on scientifically based natural and organic skincare; that immediately ticks boxes for me. They seem truly interested in using non-toxic, high quality ingredients. Antipodes use glass bottles and aluminium tubes for packaging, and biodegradable and sustainably sourced cardboard. They’re approved by the UK Vegetarian Society. I’m about to rattle on a fair bit about how good Antipodes products smell throughout this blog post but this exfoliator smells the best. It has a lovely orange scent which reminds me of those gummy Vitamin C “sweets” I used to have as a kid; it’s kinda making me crave them. 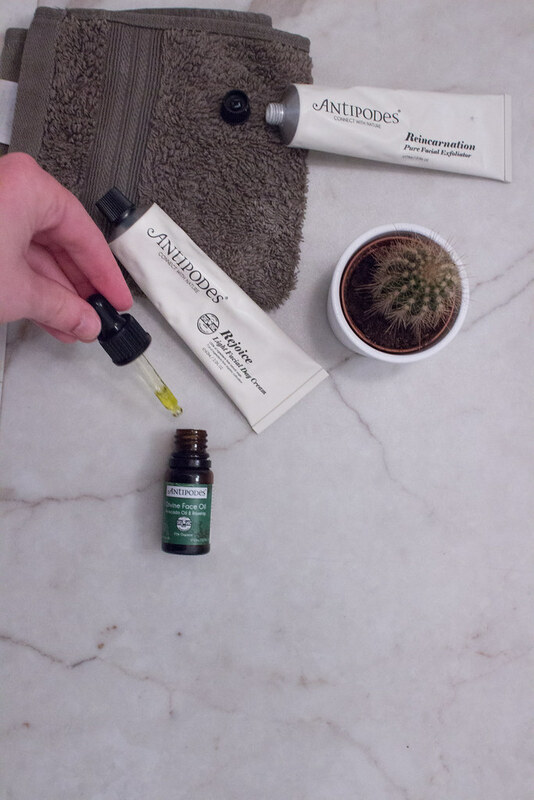 Reincarnation uses jojoba beads for exfoliation which makes it quite a gentle exfoliator; I saw another blogger refer to it more as a polish and I think that’s a pretty good comparison. I use it every morning and use a harsher scrub or exfoliating mask once a week and it’s kept my dry skin at bay pretty well. Combined with having a good moisturiser for the first time in a while and my skin is looking better than it ever has. You really don’t need to use a lot; the old “pea sized amount” is appropriate here. I’ve had this tube for a little over a month now and have used it almost every day and there’s loads left. I think this will easily last me five or six months. I’ve heard great things about the Vanilla Pod Hydrating Day Cream so it was nice to be able to test a mini version because my skin can be so fussy when it comes to heavier moisturisers. This smells delicious and is definitely a heavier moisturiser than Rejoice. It’s not too heavy at all, sinks in quickly, and doesn’t leave any kind of greasy feeling on your skin. I’ve been enjoying using it as a night cream and have found that it is really helping to hydrate my skin. Personally, I don’t think I will repurchase the Vanilla Pod cream because I am on a serious ‘try to be as vegan as I can be’ campaign at the moment, and I just don’t need to rub things with animal products on my face. When I’m out of this I think I’m going to try out their Immortal moisturiser with SPF 15. The Divine Face Oil was the biggest surprise of this little lot for me. I know that oil absorbs oil, which is great, but I have really struggled to find a face oil that I like. And by that I mean one that sinks in quickly and doesn’t make you look like someone cooked a full English breakfast on your face. To my surprise, the face oil did just that and I’ve already repurchased a full size bottle. I could barely believe my timing when I saw LoveLula were offering a full size day cream as a freebie when you purchased two or more Antipodes products. Again, I can’t justify buying a full price item only for my skin to be angry with it, so it was nice to get to try out two Antipodes moisturisers for a fraction of the full size price. The Rejoice day cream is, as the name suggests, very light (lighter than Vanilla Pod) but it doesn’t skimp on hydration at all. It sinks in quickly without leaving any kind of greasy or tacky feeling, and smells delicious. If you’re concerned about the price, a little bit goes a very long way. You just need the old “pea sized amount” and you should find that is plenty to leave your face feeling all kinds of fresh and moisturised. Note: this lipstick is not vegan – I purchased it shortly before becoming vegan. 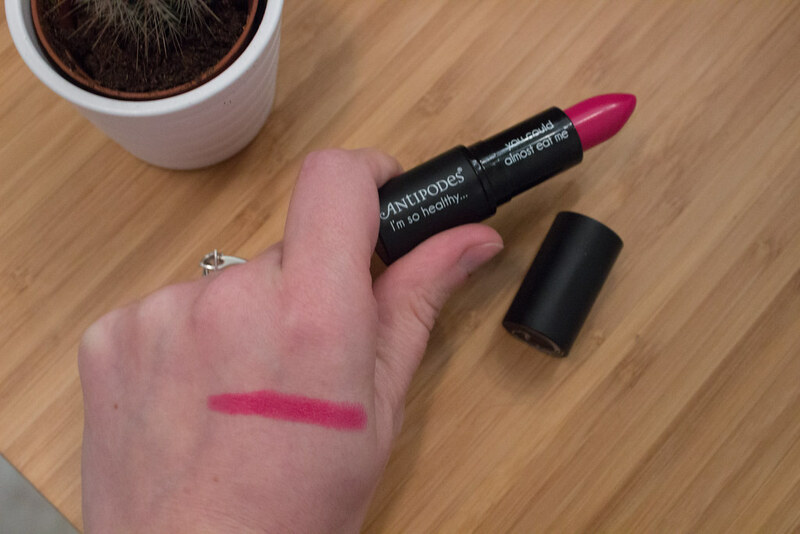 Since going cruelty free, I have been on the hunt for a dupe for my much loved Chatter Box by Mac, and I hadn’t really spotted anything which came close until I stumbled across Dragon Fruit Pink. Not only is Dragon Fruit cruelty free but it’s also toxin free, so I guess you could eat it if you really wanted. The bullet is a slightly different shape to most lipsticks and I think this lends itself to easier application. It isn’t a creme kinda formula, like Mac’s Chatterbox, it’s a little bit drier but it does go on easily and doesn’t feel thick or drying on my lips. I’ve also being eyeing up this lipstick in shade Piha Beach Tangerine too. In terms of lasting power, it does a pretty good job of lasting through eating and drinking. Like most lipsticks, and to my dismay, it won’t last all day long. That said, it’s really not going to disappear after a couple of hours of wearing it. I’ve found that it wears and fades evenly as well so it looks nice and it doesn’t look like it’s fading. Applied as it is, straight onto your lips, it’s a lovely vibrant pink colour. I’ve been toning it down for work by applying some lip balm first to give a bit of colour that I can get away with. I think it’s fairly clear to see from my fangirling that I do think Antipodes are worth the hype. I’m also very happy because I discovered a RealFoods store near us and it sells Antipodes; I don’t even need to order it online. Have you ever tried Antipodes before? What did you think?